With just one click of a button, The Bryson Power Reclining Sofa adjusts to your perfect reclining position. The leg rest and headrest both move up and down and can be stopped at any point for your custom ideal resting position. This sofa is stunning with its clean look and sleek body. Its the perfect modern sofa for any room in the house. The Cortez II Sectional will steal the show of any room its in. This sofa will give you the ulimate relaxation state with its wide seats and tracked arms. It has a low profile that features adjustable headrest and reclining functions. This is a great transitional sectional that will work great in your modern space. The Preston Sectional is a contemporary approach to the traditional leather sofa. It has a sophisticated look that is visually appealing to the eye. It’s plush body and wide seats are perfect for lounging after a long and hard day. The Baker Stationary Leather Living Room Group includes the modern leather loveseat, sofa, ottoman and chair. Each piece in this group is the perfect mid-century modern style for any transitional home. The collection is covered in 100% leather that brings such natural characteristics to each piece. This group not only brings luxury but comfort as well. Leather furniture no longer has to be oversized and bulky; its new modern look makes it perfect for apartment, and townhome living. 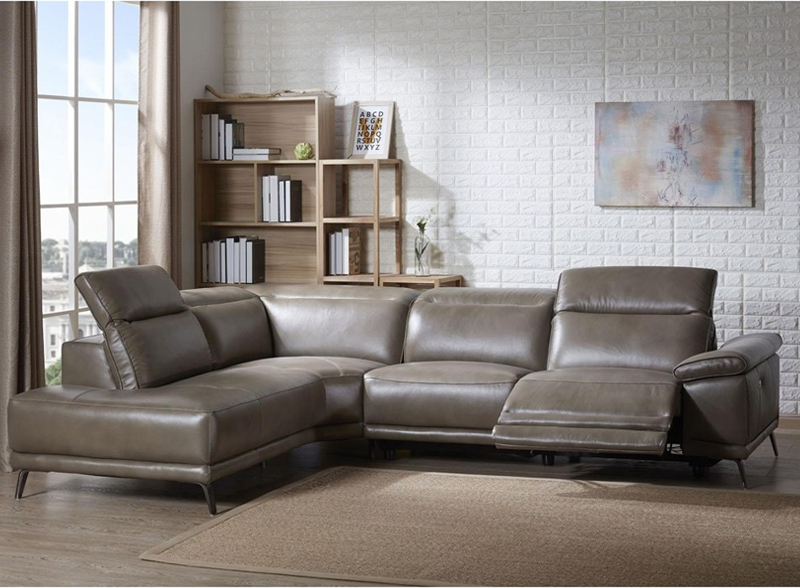 Its sleek look adds style to any room without comprising the comfort and reliability of a traditional leather piece of furniture. Shop all these styles and more at Belfort Furniture in Sterling, Virginia. Visit our showrooms for a variety of furniture styles and prices. Browsing through our 100,000 square feet of showroom space will surely inspire you.